for an improved simple corkscrew. It demonstrates clearly the ingenuity of the early corkscrew inventor/manufacturers of the 19th century, and charts, in vivid detail, the decline in quality and innovation of the 20th. and in a shortened abridgement form for patents originating abroad. Abridgements are given for all combination tools with attached corkscrews, and also for other devices to assist cork extraction. All the variant forms of each patent are clearly identified. private collections worldwide and from Christie's auction sales. Clear reproductions of engravings from published specifications are also featured. This book will be of interest to collectors, antique dealers, auction houses, patent offices, design and cultural historians, and anyone interested in correctly identifying patented corkscrews. Full patent specifications for 94 major corkscrew patents. List of all bar-mounted cork drawer patents. 125 black and white photographs. 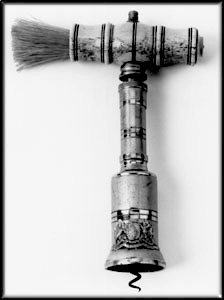 of the silver-gilt Shrapnel patent corkscrew presented to Prince Albert and now owned by Her Majesty the Queen. Short biographies of corkscrew manufacturers. Original prices listed, plus information on corkscrew markings. Information on all known patent variants of corkscrews. 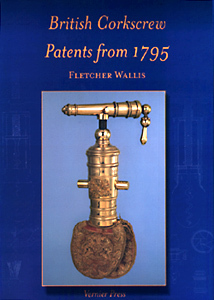 Fletcher Wallis is a corkscrew collector and dealer who has been interested in the history of patent inventions for the past 25 years. Please note that British Corkscrew Patents from 1795 is only available in a limited-edition case-bound (hardback) edition of 1000 numbered and signed copies.